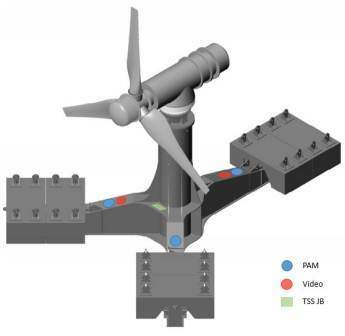 Position of Sensors on Meygen's AR1500 Turbine. The Scottish Government Demonstration Strategy has been testing a passive acoustic monitoring (PAM) system that uses multiple hydrophone arrays so that vocalisations can be tracked in 3D. By using multiple clusters of hydrophones the bearing of sound and range can be determined from the data. Three tetrahedral hydrophone clusters (4 hydrophones in each cluster) are positioned on the legs of the turbine support structure. In combination the 3 clusters enable detection, identification of species and 3D tracking around the rotor swept area and out to several tens of metres of echo locating cetaceans. The PAM units will be mounted on the TSS using a clamped system. Continuous while turbine is operating. Pentland Firth Meygen AR1500 Passive Acoustic Monitoring Data: SGDS Project is located in United Kingdom.